What’s better to have on Memorial Day than a dessert inspired by the colors of the flag? Strawberries, blueberries, cream cheese, and whipped cream are thrown together to make a very patriotic and delicious dish. You know, I just realized the last three desserts I’ve posted on here have had strawberries in them. There actually is a reason for that and it’s not because I have a strange strawberry obsession (although they are pretty yummy, aren’t they?). I completely forgot (once again) to buy raspberries when we were shopping in the neighboring much bigger town (I had planned to try making this with raspberries and white chocolate pudding). Ah, the pitfalls of living in a little town. I love it most of the time, but it’d be nice to not have to travel 14 miles just to buy something a little different than the usual. Next time, I swear I’m going to break the cycle and remember to buy raspberries when we go shopping in the Big Town. 1) In a mixing bowl, cream together the softened cream cheese, powdered sugar, and vanilla extract. Then, once all of those ingredients are completely combined fold in about a 1/4 to a 1/2 cup of fresh whipped cream (depending on how much you want in it – I used a 1/3 of a cup this time). Set that mixture aside. 2) Setting up a sort of assembly line, layer a large spoonful of the cream cheese mixture in the bottom of a glass. Then sprinkle a spoonful of graham cracker crumbs on top of that. On top of that, add a few blueberries and sliced strawberries. Repeat the layers one more time, then top with a dollop of whipped cream. I don’t think there’s ever been a better combination invented than strawberries and chocolate. Whoever first combined sweet berries with the goodness of chocolate surely deserves to be memorialized forever. Since my mother is a major chocoholic, making a dessert for Mother’s Day that contains chocolate is usually a must. 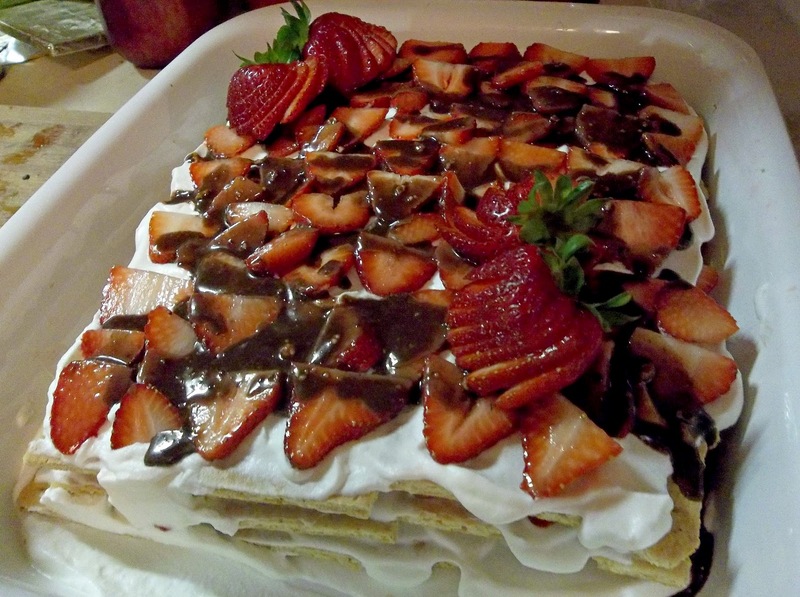 After browsing the internet for days, I stumbled on a picture of Strawberry Icebox Cake and knew immediately that it fit the bill. To top it all off, it’s a no bake, chilled dessert, which is perfect for us since we’re already feeling the hot weather that summer will bring. Not only that, it’s a really easy, but still very pretty dish. Best of all, my mother and grandmother loved this dessert and both have already asked me to make it again. 1) Reserve three or four of the best looking strawberries for garnishing the cake. Cut the tops off the rest of the strawberries and slice them. 2) Using a mixer beat about 1 3/4 cups of heavy cream (set aside the rest) until it almost holds a stiff peak. Then, mix in the powdered sugar and vanilla extract until they’re well combined. 3) Spread a thin layer of whipped cream in the bottom of a 9 x 13 casserole dish. 4) Then, top that with a layer of graham crackers. I did two rows of three graham crackers and then broke off a little extra of another to fill in the side of the pan. 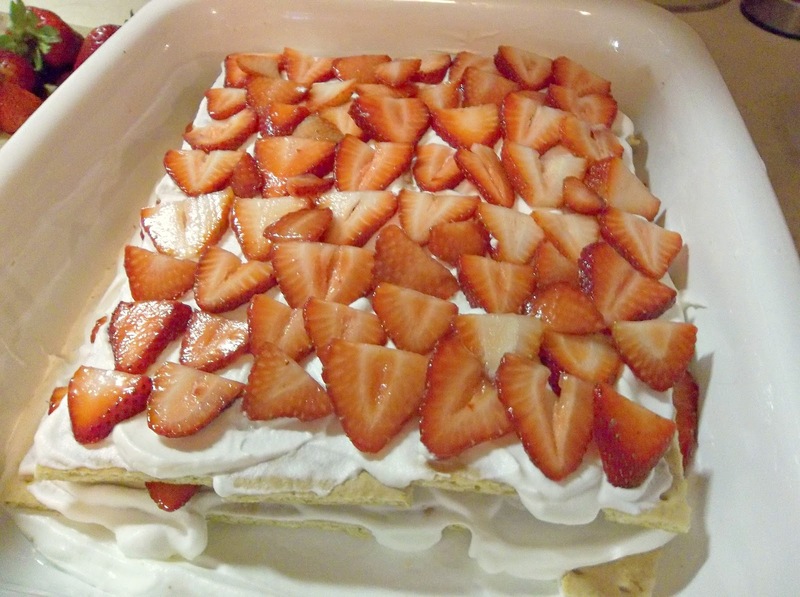 Cover the graham crackers with another thin layer of whipped cream, and place a layer of sliced strawberries on top of that. 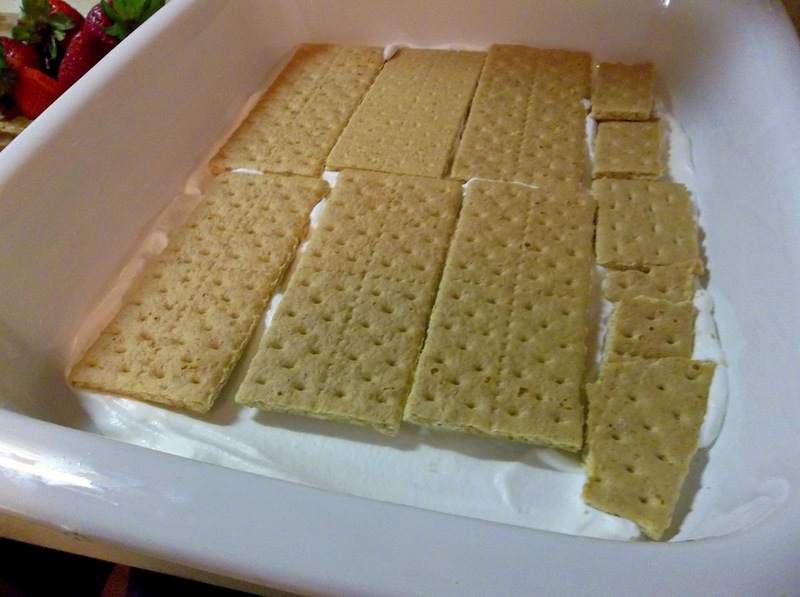 The first layer of graham crackers. 5) Repeat step 4 twice until you have three layers of graham crackers in all. Just before starting the third layer. 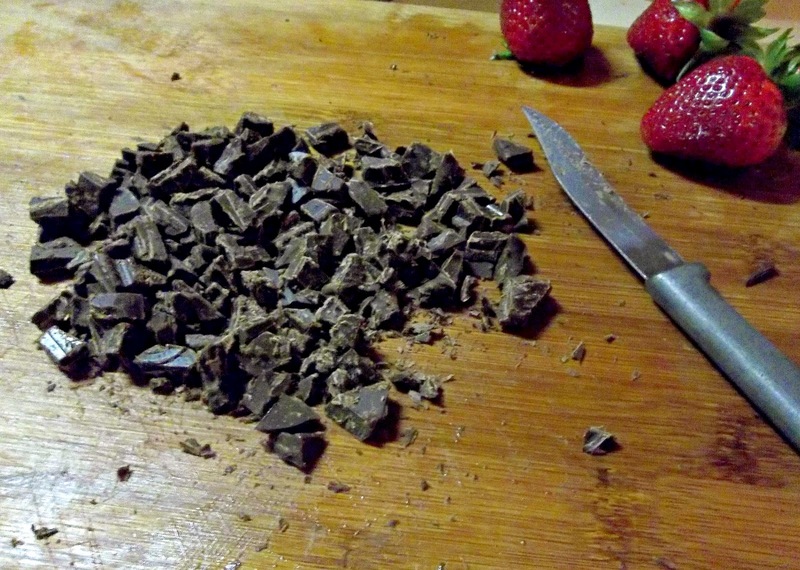 6) Chop the chocolate in to small pieces. Then, heat the reserved heavy cream (about 1/4 cup) until it just begins to bubble around the edges. In a small bowl, add the cream to the chopped chocolate and let it set for a couple of minutes. Then, stir the mixture together until the chocolate ganache becomes thicker and looks glossy. 7) Using a spoon, drizzle the chocolate over the dessert. 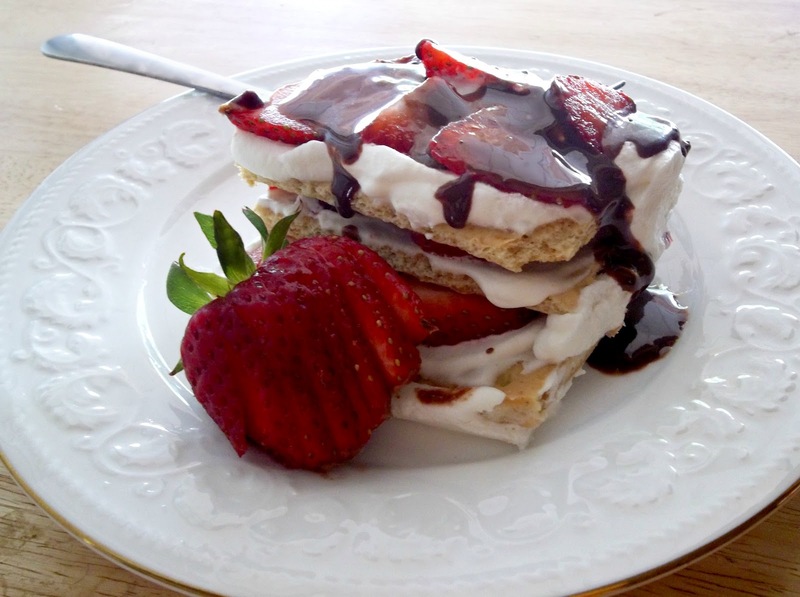 Garnish with the reserved strawberries, and place the dessert in the refrigerator for at least four hours to allow the graham crackers to soften. This is one of our very favorite desserts. The first time I made it, everyone was a little skeptical of vinegar and ice cream, but they love it now. 1) Wash and slice the strawberries (cut the large ones in half). 2) In a saute pan combine the balsamic vinegar and sugar over medium heat. Allow it to simmer until the mixture slightly thickens. 3) Add the strawberries and allow it to simmer another minute before you remove it from the heat. 4) Serve it warm over ice cream and enjoy!